Have you ever had one of those mornings when, for some reason, you wake up in a bad mood? Or you wake up in a good mood, but things soon go downhill faster than a kid on a water slide? And you find yourself able to get into an argument simply by looking in the mirror? I was having one of those days as I clomped down the hall to the office, plopped in the chair, and turned on the computer. Maybe Facebook friends could cheer me up. They helped. Then I checked my blog and found this. Well, hell-o. Where did you come from? Was I being punked? I investigated. No, I wasn’t. Well, talk about a mood changer. 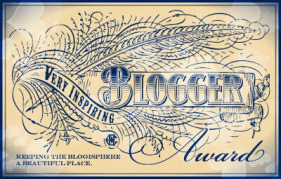 The blogger who sent this award my way can be found at viktoryarch.wordpress.com. And I send a Thank you back. It’s nice to know your words are being found and enjoyed by others. Although we can’t be blind to some ugly stuff posted by individuals and groups if we go looking, I like the award’s fine print: Keeping the Blogosphere a Beautiful Place. It is a beautiful place to learn, share, explore, and write. And today, I’m paying the award forward. www.charlotte-hoather.com – An aspiring singer shares her experiences and voice. I find her journey fascinating and motivating. jimmisko.com – Jim is a novelist based in Alaska and a super storyteller. anyshinything.com – A down-to-earth, informative, and well-researched blog about midlife crisis. dawnrenolangley.wordpress.com – Living with Izzy. Any past or present dog owner will relate. bucketlistpublications.org – This blogger is pursuing her bucket list and taking the reader with her. dianereedwriter.wordpress.com – The One Thing I Know for Sure. Poetry and thoughts are shared with great heart and warmth. thebloggess.com – Here is an energetic, humorous,, witty, and contemporary look at issues. nhwn.wordpress.com – Posted here you’ll find good information for writers. Confessions of a Book Addict – This blogger is an avid reader. A few months ago I won a book on her site: The Orchard of Lost Souls by Nadifa Mohamed set in 1980’s Somalia. Excellent. infinitefreetime.com – This is a place to enjoy a saucy and irreverent look at life. fredcolton.com – With tongue-in-cheek style, this blogger describes his expat adventures abroad. bottledworder.com – I find the content thought-provoking. headinmyhands.com – These posts are written with heart and compassion. cyndymuscatel.wordpress.com – A Corner of My Mind. Here is a look at life, sometimes quirky, sometimes heartfelt, sometimes philosophical. gwenniesgarden – Just plain refreshing! I thank these bloggers for their inspiration, their unique styles and voices, and their contributions. 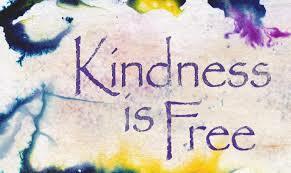 I’m also thankful for civility and the act of appreciating others, especially in today’s world. I’ll tuck this random act of kindness from viktoryarch into a place in my head where I store good things, knowing goodness and kindness are alive, and the path they inspire is built one brick at a time. This entry was posted in Creativity, Finding Ideas: The Creative Process, Inspiration, Looking for Inspiration, Writing and tagged appreciation, blog, blogging, blogosphere, civility, Encouragement, inspiration, inspiring, kindness, random act of kindness, writing. Bookmark the permalink. This is a great list, Carol! I can’t wait to explore the bloggers you identified. Thanks. Hi Lynne – The bloggers on the list cover the gamut! Enjoy! You’re welcome. Have a wonderful day! Thank YOU for mentioning me! I was just having one of those mornings that you were referring to, till I read this! My pleasure. I always appreciate your inspiration. Thank you, Christina, for your love of books! I’m on my way to visit the blogs you have mentioned Carol because if you read ’em then they are worth a look 😉 Thanks heaps for the plug, much appreciate your support and congratulations to you a very inspiring blogger. Hi Susan -The blogs in my list have a little bit of everything. Glad you enjoyed the post. Thank you for stopping by. I happy that you are happy. Truly you are an inspiring blogger, and never doubt that. Everyone has something valuable to say. Everyone has their one-kind experiences. Thank you for the validation. It’s appreciated. Inspiration is one of my goals whether I’m being humorous or serious. And thank you for the thoughts, ideas, and writings shared on your blog. I am only a shadow, that looks up to the best. I enjoy hearing your beautiful voice and reading your upbeat blog. My continued good wishes to you. Thanks for lifting me up too! My pleasure! I like hanging with good writers!